Crystal at Money Saving Mom shows you how to get FREE Purex Crystals and Colgate toothpaste this week at Target! Have you signed up for Gifts to Grow yet? If not, you should! You get a bonus 100 bonus points when you do. I rarely buy Pampers (just because I go by price, not brand) but I have over 1600 points saved up for free toys or gift cards! I plan on cashing these in for either Baby S’s 1st birthday this summer, or for Christmas. Here are a bunch of codes to get you started! If any of them say “expired” – please tell me so I can update the list! $15 Ebay Card for $7! Groupon is having a great deal! 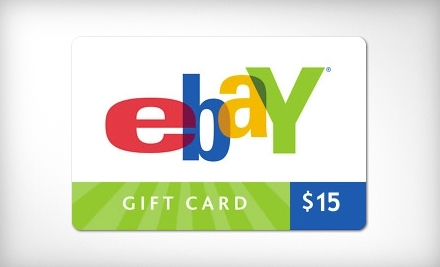 You can get a $15 Ebay gift card for only $7! Go HERE to sign up! Once you are signed up or already have an account, go HERE to see the deal. Make sure to read the fine print, as with any offer! Thanks for the heads up, Couponing to Disney! 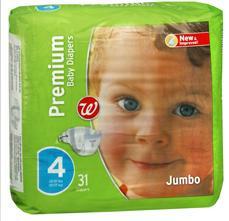 Walgreen's Diapers $1.99 after Rebate! Walgreen’s has a deal on right now for a $10 mail in rebate! I haven’t seen it print off yet, so I’m not sure if you need to buy a certain number of packages, or reach a certain amount. Christie at Wild for Wags has a senario up, and it gets them to $1.99/pkg after rebate! ANYTHING under $2.50 I consider a stockup price. Even though I do not “need” diapers right now (I still have about 15 in the closet) I can’t pass up these prices! And with a 6 month old, it’s not like I won’t use them at some point! If you do not need diapers, consider doing this deal and donating them to a mom you know that needs a little extra help or to your local food shelf! I'm not supposed to tell you what this is, so just check it out! Go HERE to get some Kellogg’s Cereal coupons also to match up with the Cub deal! Thanks for the heads up, Joni! Oh I have finally had a shop worth taking a picture of! My goal is to use my ECBs each week to get more and more free products (very little OOP) and add to my ECBs to use up next week! Jump in and join me! Thanks, Pocket Your Dollars, for this extensive Aldi list! You know what’s fun? Blessing someone. I challenge you to take a moment today to bless someone’s life. Whether you shovel your neighbor’s sidewalk (thankful for no snow here! ), pay for the customer in front of you at the store, make your parents dinner, call a long lost friend, or send a thank you card to someone who made your day – do something! It really doesn’t take that much time, and you can make someone’s day very special by doing something so little. Now, don’t be a chicken. Go bless someone! Amazon has a promotion right now where you buy 3 items and you get the 4th FREE! There are pages and pages of items that are included in this promotion! I just ordered 4 Max Lucado books (recommended by my pastor). I cannot wait to read these! And I paid ZERO DOLLARS out of my pocket because I used my Swagbucks!